An anniversary is more than just a highlighted date on the calendar. It is a celebration and a remembrance of another year spent with the love of your life: another year of love shared. As your relationship matures, each anniversary becomes more and more significant, and you learn over and over why you chose your partner above anyone else. Your anniversary is also the perfect opportunity in which to remind your partner how lucky you are to have them, and to spend some quality time together. Traditionally, an anniversary is accompanied by a gift, and the tradition of giving specific gifts for specific anniversaries dates back to the Middle Ages, when certain objects were considered to bring good luck after a specific number of years. The Germanic region of Middle Europe introduced the tradition of giving silver on the 25th wedding anniversary and gold on the 50th anniversary. On their 25th anniversary, a husband presented his wife with a silver wreath, symbolising the hard work necessary to live together in matrimony for so many years, and on their 50th anniversary, she would be given a wreath made of gold. Today, there are traditional gifts for all milestone anniversaries, but many couples choose to select their own gifts for one another, opting for more modern or functional items. Jewellery is the most apt choice for anniversary gifts, and with good reason. Symbols of “forever”, jewellery creations are made to last beyond a lifetime. Shimansky jewellery creations are inspired by the special moments in people’s lives. With each glance at a precious jewellery creation, you are reminded of the beautiful moment that it was given, and received. The combination of the finest precious metals and diamonds, design excellence and technical precision, Shimansky jewellery reaches its full potential when worn by the person it was meant for. Selecting an anniversary gift for the one you love is a personal experience, and it should be guided by your personal preferences and taste. In addition to a beautiful eternity ring, earrings, bracelets and necklaces make stunning and meaningful anniversary gifts as well. On your quest of finding the perfect jewellery creation, bear in mind the type of jewellery your partner already has. If she has a Shimansky Millennium Diamond Engagement Ring and matching Wedding Band, for example, a natural choice would be the matching Millennium Diamond Earrings or Pendant. If your partner has always marvelled at Tanzanite jewellery, then a creation from the Shimansky Ayanda Queen of Tanzanite Collection is a good option. There is no right or wrong anniversary gift – the key lies in finding the jewellery creation that speaks to your heart, and that you feel captures the essence of your love and devotion. When you purchase jewellery, you own a creation that will last beyond your lifetime, and will be passed down as a precious heirloom to the generations that follow. That is why it is important to take the time to select the piece that is right for you, and the one you love. Considered the ultimate romantic gift, the eternity ring has been a popular anniversary gift for decades. Archaeologists have since discovered rings made from carved bone, elaborately decorated with beads, gems and carvings all the way around the band. These are considered the earliest forms of the modern eternity ring, which today, is a precious metal ring, decorated with diamonds or gems all the way around the band (full eternity ring), or halfway around the band (half eternity ring). This continuous circle that cannot be broken, is symbolic of the strength of your love. Decorated with diamonds – nature’s strongest and indestructible gem – the eternity ring immortalises your love, and is a precious gift to pass down from generation to generation. Shimansky eternity rings are made from the purest platinum, or 18K white, yellow or rose gold. Decorated with the finest hand-selected diamonds, they celebrate your eternal love, and unique relationship. 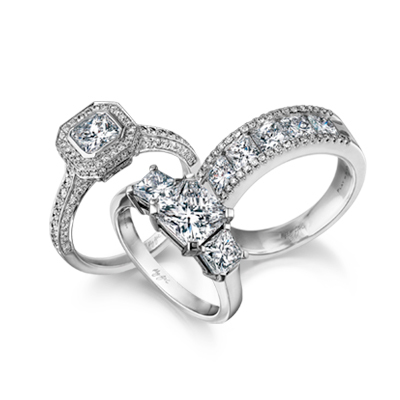 Shimansky eternity rings are available in a variety of different diamond cuts and styles. When selecting yours, you will have the option of choosing between the emerald cut, cushion cut, round cut, or the Shimansky-exclusive My Girl Diamond cut. Available in both a channel setting, as well as a claw setting, in full eternity, and half eternity, the selection of Shimansky diamond eternity rings is diverse, allowing you to find the perfect ring to meet your preferences. However you choose to celebrate your anniversary, take the time to stop and enjoy the precious moment before it passes. With today’s busy lifestyles, it is easy let a moment pass without giving it the attention it deserves. An anniversary gift is more than an object: it is a declaration of love, and a symbol of how you feel about your partner. Select a jewellery creation that has personal meaning and significance to you, that will stand the test of time, and that will be treasured forever.